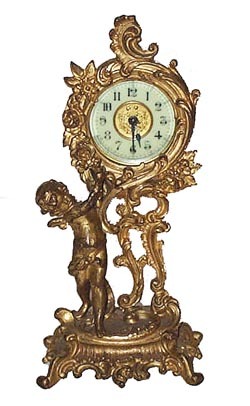 Ansonia Clock Co. novelty clock, "Eveline", ca 1904. 8 inch metal case finished in gold gilt, 80 percent of which is remaining. 2 inch porcelain dial, gilt center, signed around the base of the dial. Runs fine, 30 hour of course, winds in the back. Ly-Ansonia No. 2121.